It was a game of few chances at Turf Moor as Burnley and Huddersfield played out a goalless draw. Neither side registered a shot on target in the first half, but Huddersfield’s Tom Ince and Laurent Depoitre came relatively close in the second. Burnley’s strike force failed to turn up in the game and the result leaves both teams level on nine points in the Premier League table. One-time Everton outcast Oumar Niasse earned his way into Ronald Koeman’s good books as he bagged a late brace against Bournemouth to seal all three points. The visiting Cherries had originally taken a first half lead courtesy of Josh King’s low strike into the bottom corner. Everton, who had been struggling for form of late, were then handed a vital lifeline as Niasse – who wasn’t even given a squad number at the start of the season – turned in an equaliser in the 76th minute. The forward, who spent the second half of last season on loan at Hull City, then bundled in the winner with just nine minutes remaining of normal time. Manchester City cruised once more to a high-scoring victory as basement club Crystal Palace failed to contain the plethora of attacking talent at Pep Guardiola’s disposal. On-loan Chelsea midfielder Ruben Loftus-Cheek gave City a scare as he struck the post in the first half but it was soon business as usual. Leroy Sane opened the scoring just before the break with a delightful finish before Raheem Sterling grabbed a double within the space of eight minutes after the interval. Goal machine Sergio Aguero added a customary strike – as he closes in on City’s all-time scoring record – in the 79th minute. But the pick of the goals came from forgotten man Fabian Delph who curled in the fifth goal late on to consign Roy Hodgson’s Palace to another desolate defeat. Romelu Lukaku’s sixth goal of the season was enough for Manchester United to continue their winning run against Southampton. The Belgian forward pounced in the 20th minute to turn home from close range after Saints keeper Fraser Forster saved his initial effort. Red Devils boss Jose Mourinho was sent to the stands late in injury time but, while the result was not as routine as normal, United remain second in the league table and are still unbeaten. 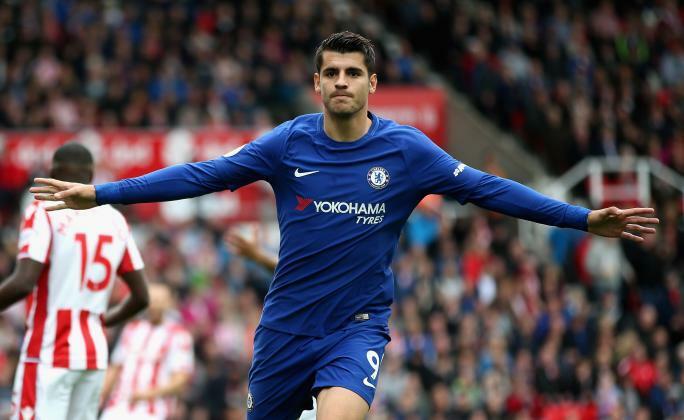 Alvaro Morata banished memories of Diego Costa as the Spanish striker bagged a hat-trick in Chelsea’s demolition job of Stoke City. The summer arrival opened the scoring just two minutes in as Stoke’s back three – boasting just a single recognised central defender – failed to deal with Cesar Azpilicueta’s long ball forward. A terrible mistake from Darren Fletcher allowed Pedro in to double the Chelsea advantage on the half hour mark. Mark Hughes may come to regret his decision to substitute Bruno Martins Indi in the 76th minute as Morata soon doubled his tally the following minute. The Spaniard then sealed his first hat-trick in English football in the 82nd minute with Antonio Conte’s Blues looking comfortable throughout. Richarlison was the hero for Watford as the Brazilian struck a dramatic 90th minute winner to give the Hornets all three points against Swansea. Andre Gray had opened the scoring in the first half – his first goal since moving from Burnley in the summer – with an expert finish into the top corner past Lukasz Fabianski. Swansea striker Tammy Abraham levelled for the Swans in the 56th minute but Richarlison’s dramatic winner silenced the home crowd at the Liberty Stadium. Watford now sit fifth in the table while Swansea lie in 14th place.